Limbal relaxing incisions (LRIs) treat low to moderate degrees of astigmatism . As the name suggests, the surgeon makes small relaxing incisions in the limbus, which allows the cornea to become more rounded when it heals. LRIs are placed at the very edge of the cornea (in the limbus) on the steepest meridians. 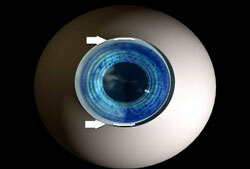 LRIs are often combined with cataract surgery . LRIs are not the only surgical procedure designed to correct astigmatism. If you would like to learn more about vision correction procedures you may also choose to make an appointment or request additional information.